To double or triple your sales, I believe we can help you achieve this if you use our LED Linear Module or LED Light Engine instead of Osram's or Phillip's. 1. This is a 11 inch LED Linear Light Module which has wide application, like wall pack, shoebox or anywhere which you can think of. The size is not fixed, which can be tailored to your need. Of course, it can be round LED Light Engine, Square LED Light Engine, or irregular shape Light Engine Module. 2. This LED Linear Module or LED Light Engine uses Seoul 2835 or LG 2835 LED, this is the most commonly used LED Package in LED Linear Module or Round LED Light Engine. It makes economical sense and it achieves high efficiency. This LED can get to 200lm/W without considering power supply or lens loss . After power supply and lens loss, it can easily get to 160lm/W. For customers who wants to make high efficient indoor lighting fixtures, this is a great option to embed in an efficient Indoor Lighting LED Light Engine to achieve the result. 3. This LED Linear Module can pass L70 and L90 test. For a lot of LEDs, which can pass L70 test, but it is not qualified to pass premium DLC L90 test. For some customers who need L90 standard LED Linear Light Module, this LED works witout doubt in terms of economical sense and efficiency. 4. 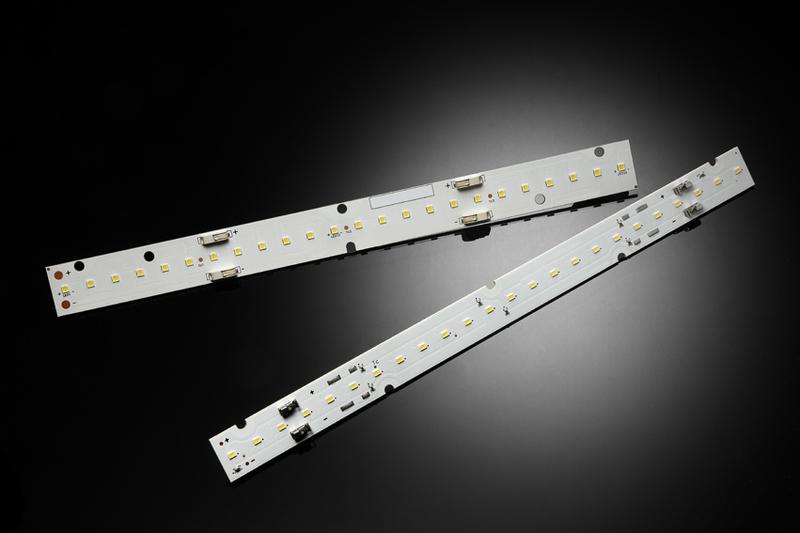 The LED linear Module uses aluminum PCB, which can help dissipate the heat well. For luminaries, heat dissipation is critical, which maintain lifespan. For customers who need FR4, option is available as well. 5.This LED Linear Module Uses snap In reduces the cost of soldering wire. Wires can pop in connectors and it doesn't require skilled soldering technician. this reduces the cost to hire a skilled soldering technician and it increases the efficiency to assembly. 6. As one of the professional LED Linear Module China Suppliers, our quality is not second to some world brands, but our service is better in terms of delivery, fast responce, and after sale service. 7. Some people still has stereotype that made in China means bad quality, but we are pround to be labelled as manufacturers LED Linear Module, LED Linear Module China because we are confident that our LED Light Engine Module is high quality and makes better economical sense. 8. Our Linear Light Engine is made in China, and our main markets are American, South Asian and European Markets which include countries like US, UK, Japan, Germany, Italy and Canada, etc.